Mock Apple Pie is a recipe that has been sitting in my recipe box for a long time. This recipe was one that was in my Grandmother’s collection. I don’t know why I put making this pie off for so long. It was right up my alley, it is a fun recipe, it has “unusual” ingredients, but it tastes amazing like apple pie. So you might be asking yourself why in the world is this called, “mock apple pie”, well it has no apples in it. This is a recipe from Ritz crackers. Ritz crackers are what makes up these apples. This pie is made just like an apple pie, with the exception of the apple pie. A sweet syrup is made, and the crackers are seasoned just like you would an apple pie. I had more fun with this recipe when I brought this to work, as everyone thought this was apple pie. I set it out on the counter where all food goes, and as people got a slice of pie, I asked them what type of pie is that most everyone said apple pie. I told them no, it wasn’t apple pie. Everyone looked surprised when I told them it was Ritz crackers. Then I got asked for the recipe. So, this isn’t my original recipe; this is a recipe that I believe was shared on the back of many boxes of Ritz crackers. I hope you enjoy this pie, it is easy to make, and it tastes excellent. You can fool everyone with this Ritz Cracker Pie, it really does taste just like apple pie. In a medium-sized saucepan combine water, sugar, and cream of tartar bring to a boil. Once the syrup begins to add the lemon juice and lemon zest. Stir lemon juice and zest into syrup in the mixture, reduce heat to low, and simmer for approximately 15 minutes, after 15 minutes allow syrup to cool. Place one pie crust in a pie pan, and then break crackers into the pie shell. Pour syrup over the crackers. Sprinkle cinnamon over crackers, and sprinkle over nutmeg over the crackers. Place the butter pieces on top of the crackers. Top with pie shell with remaining pie crust. Pinch together crusts and then trim off excess pie shell. Make a couple of slits in the top of the pie so the steam can escape while cooking. Bake for 30 to 35 minutes or until the pie crust is golden brown. How cool does your syrup have to be before you put it in our shell? It should be warm, but not overly hot. My husband has been going on and on about wanting a homade apple pie. So i called my mom up and started asking for her recipe, I was completely shocked when she told me about Rits mock apple pie. Can not wait to make it and let my husband try it. Im not even going to tell him what it actually is until he says somthing. What a suprise for everybody! 🙂 will update when i make it. Did you try this? I swear it tastes like apples. It totally fooled my co-workers. Wow!! This is amazing how close it tastes. Stephanie, Made this pie today and yes it taste like apple pie. Don’t know what I did wrong but you have to eat it with a spoon. I went over the recipe and some others and I was right on with ingredience. I don’t understand why its runny. It may have needed to cook a little longer. The way ovens sometime cycle through heat means your pie isn’t cooking at the proper temperature 100% of the time. Sometimes a little more, sometimes a little less. If the pie is still warm the sauce may thicken some during cooling. Thanks for your quick response. I never give up so I will try again until I get it right. For now I will put it in a cup and serve with a spoon!! It is amazing how it taste just like apple pie. It is really surprising how much this tastes like an apple pie. I grew up on Ritz Cracker Pie. It was great when real apples weren’t available, back in the Dark Ages of my youth. This pie is surprisingly good. I really enjoyed this pie, and all of my co-workers were completely surprised. That’s funny. 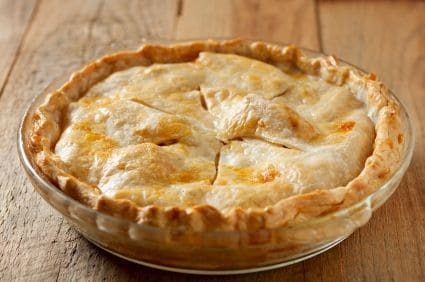 I stumbled upon a recipe for Mock Apple Pie online the other day and considered making one to try it out. Yours looks great! Well I have to say these crackers make for a great substitute.